Someone correct me if I am wrong here, but in general, conservatives want smaller government and less spending, right? So why do they tend to live in sprawl areas? When they are first built, new suburbs cost the taxpayer money to generate the infrastructure to live there (spending), and in many places, especially here in the Cincinnati region, each new suburb has its own local government, police, fire, etc. (more people on the bureaucratic government’s payroll). Conservatives: why not practice what you preach by living in areas that do not necessitate wasteful spending and bloated government? Discuss. Because they would be forced to interact with people who are different than them? Conservatives lost any credibility on the whole fiscal responsibility argument when three of their presidents caused the national debt to explode with bloated military spending, tax cuts for billionaires, and ill-advised quagmires on foreign soil. I don't think there's any question that some smaller suburban governments are ran much more efficiently than that of Cincinnati or Hamilton County, and an argument can even be made that township's are a better system than incorporation. I don't have the stats, but I would bet that overall government spending per resident in an urban area is higher than that of a suburban resident. There are millions of factors at play, so it's really a tough and awkward debate to even have. Anyways, my belief as a conservative is that the more localized government can be, the better. We see a need for this even in a larger city like Cincinnati, that has a strong reliance upon and interest in community councils. As for spending, investing in infrastructure is smart spending. This includes the interstate system, rail transit, and (locally) the streetcar. There are many, many social programs that are fiscal black wholes, and should be eliminated. Suburbs are not a black whole, and are necessary for regions to survive. Oh yeah, and then there's the minor problem of the township's government being run by amateurs whose concept of their positions is to give away as much as possible to any and all businesses who offer even the slightest amount of "development" to them. A prime player in this game includes Walmart, of course, but there are many others who slide under the radar, but who get tax abatements and various other tax incentives such as the ever-present bond issues to pay for infrastructure improvements that help these speculators increase the value of their investments at public expense. Good point Randy, Green Hills is a perfect example of a planned suburban community that required extending city infrastructure. Also due to Ohio Law, the city is required to charge customers outside the city the same rate as city residents for services. This basically equates to cities enabling sprawl, i.e. enabling the decay of our cities. Doesn't Finney live in Anderson Township where he enjoys the city water at the same rate as the actual city residents? "Anyways, my belief as a conservative is that the more localized government can be, the better. We see a need for this even in a larger city like Cincinnati, that has a strong reliance upon and interest in community councils. " I think we have the opposite need, we need metro government. Greg Harris is seems to be really pushing some metro principles that I think conservatives and liberals alike should support. I do agree that suburban areas are inherently less efficient than more urbanized areas, but it should be noted that I did not write this particular piece - UrbanCincy writer David Ben did. @Local Architecture - I would say that localized attention is needed in efficient governments, but that should be a part of a larger governing structure. What I mean in real terms is that Hamilton County could operate as a unigov and still have unique localities within it while also benefiting from economies of scale. Our current system of fragmented governments does not work as well as it could and seems to squander limited public dollars if you ask me. Agreed. I actually wouldn't mind seeing the City of Cincinnati consolidate with Hamilton County to form a unified metro government, similar to Miami-Dade and Jacksonville-Duval in Florida, Philadelphia, NYC, LA, etc. County governments serve an important role in rural areas where large portions of the county are unincorporated, but in major urban areas they're usually little more than patronage playpens (see: Cook County, Illinois). I agree that some type of local accountability is also crucial. I could see the metro city-county government handling the big-ticket issues like police, fire protection, infrastructure, etc. Neighborhood councils or community boards could then handle more day-to-day issues like driveway permits, trash pickup, etc. Not that I think a unified Cincinnati-Hamilton metro government will realistically happen anytime soon, but it's an idea worth giving some though to. ^Yeah Louisville certainly has no problem doing that with their metro government. It's kind of silly. Indianapolis, Louisville, and Lexington are already merged with their counties. Pittsburgh may put the matter to referendum as early as next year. Wow, didn't know about Pittsburgh. Lexington also has an urban service boundary if memory serves me correct. I don't see why expanded services in suburban areas are less efficient than in large urban areas. 1) As the populations of urban areas increase, the number of fire, police etc. has to increase as well. The population of West Chester is about 60,000. They have about 80 sworn police officers. (1 officer per 750 people). The population in Cincinnati is about 300,000. They have 1,050 sworn officers. (1 officer per 285 people). Granted, West Chester has fewer officers per population because it has less crime, but the point is that larger cities require a greater workforce. If all the residents in West Chester lived in Cincinnati, there would probably be a proportionate rise in the number of officers. This would result in a similar increase of police stations, cruisers, guns, etc. No matter where the population grows, money must be spent on increased services. What I'm saying is that it's a wash. Population dictates the need for expanded services. I don't see how sprawl increases the costs. 2) I can't believe no one has brought up the cost of police/fire/municipal unions. But these unions are generally stronger in large urban centers. The more strength unions have, the more these services cost (this is not a good-bad issue, but from a pure cost perspective, stronger unions are more expensive). That's why police officers in Cincinnati or Dayton are more expensive (not just in pay, but in benefits, perks, etc) than in suburban areas. Because these unions in suburban areas are not as strong (due to the conservative nature of the residents), municipal employees are less expensive. The ability of suburbs to reign in the FOP/IAFF/AFSCME/OEA arguably results in less expensive, and thus more efficient, services. I read an interesting article comparing the prosperous San Gabriel Valley and the increasingly poor San Fernando Valley in California. Both lie north of the core of downtown Los Angeles and have a lot in common geographically. Yet one valley is prospering and the other struggling. One big difference is that the SFV lies within the city limits of LA and the SGV encompasses many small suburbs. The tiny suburb model allows residents to bulk up education and police spending which create desirable places to live compared to the ineffective city government of LA. I think the keys to getting families to live in Cincinnati or LA is to provide great schools and safety. Because if you don't, fleeing to the suburbs makes logical sense. "There are many, many social programs that are fiscal black wholes, and should be eliminated. Suburbs are not a black whole"
I talked to a lady online once. She lived in an exurb. She was going blind and had had hip and knee replacements. She had no way to get around, she couldn't drive, bike, skateboard & there was essentially no bus service. She needed a lot of medical care, she could work (her diminishing vision would eventually prevent that) but had no way to get to a job on a regular basis. My advice was to move to the city. This can become a weird situation, though, where all the able bodied people with good incomes locate outside the city and the people living in the city, which can more efficiently provide services and social programs, only live there for the services. Those people tend to earn less, if any, money and cannot sustain the city. So, what ? Eliminate the weak ? A metro government might work but then people could just run away from the entire metro region. Would love to here more stuff on the metro governing model. Couldn't find anything on the net about it. It seems like both the city and county government might experience layoffs from such a move. And residents in the suburbs might freak out. So who would actually push it? "...governments are ran more efficiently" ?? Gotta love those sprawl-land public education systems and their wonderful product. Or perhaps Local Architecture's parents put their money into one of the excellent exurban private schools. @Radarman. That's a little childish, don't you think? It's irritating to see attacks for incorrect grammar and typos on an internet message board (this isn't the NY Times). Stick to the substance, please. And to question the quality of exurban schools is just ridiculous. I'd refer you to the Ohio Department of Education's report cards for Lakota, Forest Hills, Mason, Springboro, etc. The quality of these schools is self-evident. Urban centers need to become more competitive or more innovative. But the fact that urban public schools lag behind their suburban counterparts is undisputed. Of course services in a subrurban area are more expensive than an urban area. It takes the same resources to plow a street in OTR as it does in Westwood, only in OTR you could have a few hundred people living in one city block where as in a suburban area you might have one or two single family homes. Policing is another good example of a service that is more expensive in an suburban area. The number of officers needed is more directly correlated to space rather than population. More simply, you don't need cops sitting around idling with a radar gun on 5th street, but you do need such a service out in the burbs, not to mention there is less of a need for v8 cop cars in a dense urban area. Also, don't you think miles of water mains out to the suburbs are more expensive to maintain than a smaller and denser urban area? However you slice it, suburban living is not as efficient as urban living. All those "green" efforts aren't going to mean anything if we live in 5,000 sq ft single family homes on two acre lots twenty miles form the city. Also, think about that wind storm last year and the cost of the damages. Such costs are mitigated in an urban area where there aren't miles of electrical wires running along trees. I can't think of any viable argument that suburban lifestyles are as efficient as urban. "And to question the quality of exurban schools is just ridiculous. I'd refer you to the Ohio Department of Education's report cards for Lakota, Forest Hills, Mason, Springboro, etc. The quality of these schools is self-evident. " I think you're flat out wrong. Seems to me Walnut Hills was the highest ranked public school in the area, even beat out my alma mater Wyoming, Indian Hill didn't even come close and thats as suburban and privileged as you can get. There is nothing fundamentally wrong with American cities, we need to get rid of this progressive era stinking thinking that the problems of the city are unsolvable and that the only solution is to relocate outside the city. I can see that there are expenses, but as I said in a previous post, most of these costs (new services, municipal buildings, schools) are paid for on a local level by township/city funds. The costs of expansion are borne primarily by the people moving out to the suburbs. As for the extra costs on those left behind in the city (maintaining existing roads, etc. ), I don't see how you can blame people who move out to the suburbs. People have the right to live where ever they want. They shouldn't be forced to stay in an area that isn't conducive to their lifestyles. If cities want people to want to stay there, they need to give people a reason to live in the city (better schools, better public transportation, better something--the costs of living in the city have to outweigh the benefits of living in a suburb). As for conservative values and suburban sprawl, I don't see how moving to a small exurban city/township is inconsistent with these values. The original poster talks a lot about efficiency and spending money--not about small, efficient government. Conservatives don't mind spending money (even lots of money--look at the military) if they feel the government is using the money usefully. Conservatives just think that there are few things that are worth spending their (emphasize *their*) tax dollars on. This is completely consistent with expanding out into the suburbs. It just so happens that these suburbs often (not always, but often) have smaller, more efficient governments. In Ohio townships, you cannot charge an earnings tax, and therefore any additional government expenditure requires a levy passed by a referendum. Conservatives in the suburbs pay huge property taxes for better schools. But they have confidence that the smaller school districts are spending the money wisely. Conservatives often think that "big city government" is wasteful and full of special interests. Thus, moving to the suburbs, while possibly expensive, is consistent with conservative values. @UCStudent. Please, spare me your "Walnut Hills". Walnut Hills is the exception. You have to take an entrance test to even get admitted, and then you have to take FOUR YEARS OF LATIN to stay at Walnut. Hardly any average CPS (or average student anywhere) would thrive at Walnut. (Jesus, your average US Senator couldn't make it through Walnut). Walnut Hills is an excellent Cincinnati Public School. But it is not feasible for your average person. Walnut is specifically designed to be an elite school. It is not a school for the masses. I think hanging your "CPS is great!" argument on Walnut is a little weak. What is the next best CPS school? Without researching, you probably don't know. Because there aren't many. I never said CPS was great, I said that Walnut Hills is the best school in the region. I took the entrance exam, it was incredibly easy and I believe I was four points away from a perfect score. I was a bad student in high school, I had a 2.8 GPA and at the time Wyoming was ranked 8th in the nation. There is nothing fundamentally wrong with city schools, it has a lot more to do with a student base coming from areas of concentrated poverty like OTR, West End, Corryville, Winton Terrace, etc. How can you expect these students to compete when they are segregated and isolated? The problems of the city aren't the fault of those who moved out, no one made that argument. The fact remains that the city does have problems from residents leaving, that is undeniable. The advantages of city life could be realized through infrastructure like the streetcar. You haven't really made an argument for or against anything being discussed. @UCStudent. Not to get in a tiresome debate, this thread clearly reflects that my first post was directly related to the efficiency and costliness of suburban growth, which was the topic of the original post. I admit that a discussion of public schools is irrelevant to the post. But someone made a snarky remark about the quality of exurban education, which was plainly incorrect. I apologize for getting us off topic. And I don't see how people aren't arguing that it's the suburbs/suburbanites to blame for urban decline. This whole post is dedicated to the hypocrisy of conservatives living in suburbs. The implication is that conservatives should want to live in the city. I am simply arguing that there are other things to be considered, none of which are inconsistent with conservative values. I hope these posts don't sound too combative. I assure you I am on your side--I would love to see the city thrive (and it can, and it will). But many urbanists question the value of living in the suburbs as if it is, well, stupid (my argument is that it is actually quite reasonable). We need to take a critical eye to the problems of cities to solve them. And poking fun at the suburbs (or their residents) is useless. Is this a serious column? "Someone correct me if I am wrong here, but in general, conservatives want smaller government and less spending, right? So why do they tend to live in sprawl areas?" Why do liberals claim to care about "climate change" yet Nancy Pelosi jets across country on the USAF's largest transport jet, Al Gore's house uses 3 times the electricity as his neighbors? Dem Senator's ride in SUV's and luxury cars instead of a Ford Focus? This should be interesting fodder for your next article. WHHS actually does have open enrollment. I lived in Amberly Village at the time and I attended CCDS, but my father was absolutely infuriated at the idea of paying taxes for school that his kids weren't attending and paying tuition for private school, so we moved to Wyoming, which seems to be the last true _community_ in the region. I never attended WHHS, but a good friend of mine who lived in Indian Hill opted to pay to attend walnut rather than IH schools. I'm just making the point that the city (or its schools) isn't an inherently problematic place, or at least no more so than the suburbs. Look at Springfield Township or Lincoln Heights, they have areas just as bad if not worse than any area in the city. 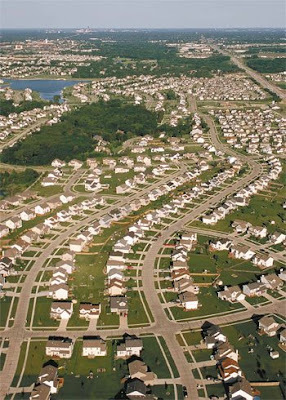 Suburban living is inherently less effecient than city living, and I think we'll see the cities grow and the suburbs shrink as we as a society make the push for environmentally friendly lifestyles. I don't blame suburbanites, that would be silly. The "fault" is not important, but it is undeniable that flight to the suburbs contributed to many of the problems in the city. It isn't the "fault" of individuals though, you are correct. The advantages of city life are/were nearly nonexistent in Cincinnati compared to a place like Chicago. I live in the Basin, but I can't walk to a single store, and to be honest the closest bus stop isn't a place I would like to wait at. A good friend of mine was a VP at Gilette in Boston, she makes over 500k a year and has never owned a car and takes public transportation on a daily basis. P&G aggressively purused her to relocate to Cincinnati, but there was no place for her to have the lifestyle she wanted here. The streetcar seems to be the single most important element in creating the possibility of such an urban lifestyle. Jeeze, and you thought my posts were irrelevant. "Dude", that really has nothing to do with what we are talking about. Everyone reading this blog is dumber for having read your post. You receive no points, and may God have mercy on your soul. Dude, there is no democrat or republican way to fix a pothole. Taking responsibility for the city we call home is not a partisan issue. Everyone driving a ford focus is just as problematic as everyone driving an SUV. We need to return to having a strong urban core, i.e. a walking city. Without extensive public transportation this is nearly impossible. In 1870 Cincinnati has the second highest population density in the country, second only to NYC. I think we can all agree that we'd like to see the city return to its previous prominence. @UCStudent. I agree with you. 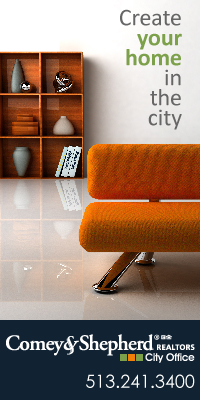 It is all about the advantages of living in a city. I think the streetcar will really push the ball in the other direction (was that a metaphor? oh well, food coma). The streetcar is exactly the kind of stuff that will make living in the city a better place. How can sprawl cost they same as dense urban areas? If it cost the same to run a couple blocks of sewer/water/electric whether its suburban or urban wouldn't it be cheaper if it was split 150 ways instead of 20? Excellent discussion here, folks. I really appreciate that you all took the time to lay out a logical and relevant argument. I hope you'll feel free to continue the discussion here. I'm sure that we'll post other conversation starters on here in the future, so check back often. If there are topics you'd like us to cover, e-mail me at davidcben@gmail.com or suggest them to us on twitter (@davidcben or @urbancincy). I'd ask you not to post suggestion in this comment section, though, because I don't want this discussion to get off topic for those that want to continue it.